How many prints can I get from a 75 ml cartridge? What is the setting time? 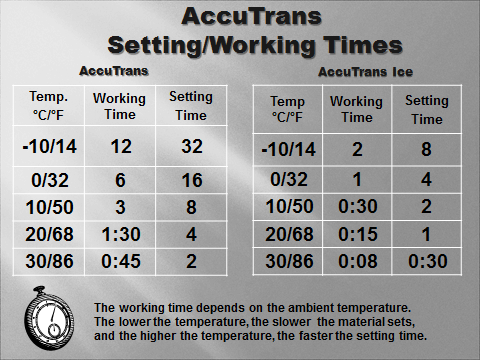 The working time depends on the ambient temperature. The lower the temperature, the slower the material sets, and the higher the temperature, the faster the setting time. Shelf–life is 2 years from date of manufacture. Expiration and batch numbers are printed on the cartridge labels. Store at 59-73°F / 15-23°C away from heat and sunlight. Impressions should be stored at room temperature. Prints are permanent on the lift. They cannot be smeared or smudged. Will the dimensions of my castings change? The dimensions will not change. Castings will not shrink. Flexible and accurate; and will not tear. Can I use AccuTrans on rough surfaces? Yes, AccuTrans is ideal for rough surfaces: Styrofoam, Bricks, Leather, textured Computer Housings, Human Skin, etc. What are the different colors used for?